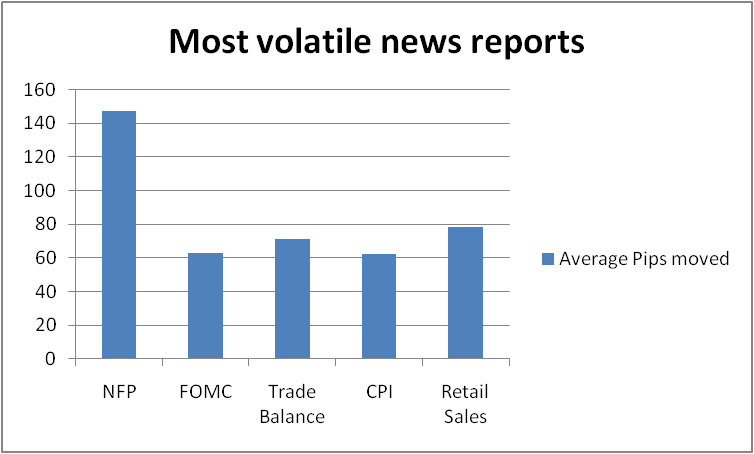 Before we even look at strategies for trading news events, we have to look at which news events are even worth trading. Remember that we are trading the news because of its ability to increase volatility in the short term, so naturally, we would like to only trade news that has the best forex market moving potential. While the markets react to most economic news from various countries, the biggest movers and most watched news come from the U.S. The reason is that the U.S. has the largest economy in the world and the U.S. Dollar is the world’s reserve currency. This means that the U.S. Dollar is a participant in about 90% of all forex transactions, which makes U.S. news and data important to watch. With that said, let’s take a look at some of the most volatile news for the U.S. In addition to inflation reports and central bank talks, you should also pay attention to geopolitical news such as war, natural disasters, political unrest, and elections. Although these may not have as big an impact as the other news, it’s still worth paying attention to them. Also, keep an eye on moves in the stock market. There are times where sentiment in the equity markets will be the precursor to major moves in the forex market. Now that we know which news events make the most moves, our next step is to determine which currency pairs are worth trading. Because news can bring increased volatility in the forex market (and more trading opportunities), it is important that we trade currencies that are liquid. Liquid currency pairs give us a reassurance that our orders will be executed smoothly and without any “hiccups”. Did you notice anything here? That’s right! These are all major currency pairs! Remember, because they have the most liquidity, majors pairs usually have the tightest spreads. Since spreads widen when news reports come out, it makes sense to stick with those pairs that have the tightest spreads to begin with. Now that we know which news events and currency pairs to trade, let’s take a look at some approaches to trading the news.